← Magna Carta goes platinum? Yeah, I called that. Like to blog? Get Blogsy. It’s been a while since I reviewed any apps. 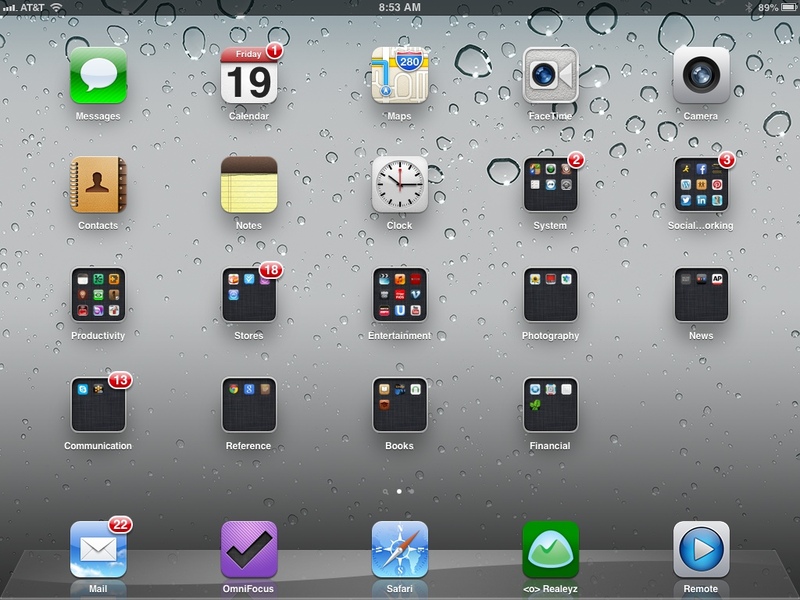 So today, I decided to take a look at the apps I have on deck and talk about one of them. Checking out the apps on my iPad, the choices are many. I’ve got them arranged (roughly) by category: productivity, social networking, entertainment, finance, etc. Since I find myself opening up my social networking dash quite often, I figured I’d write about one of them. 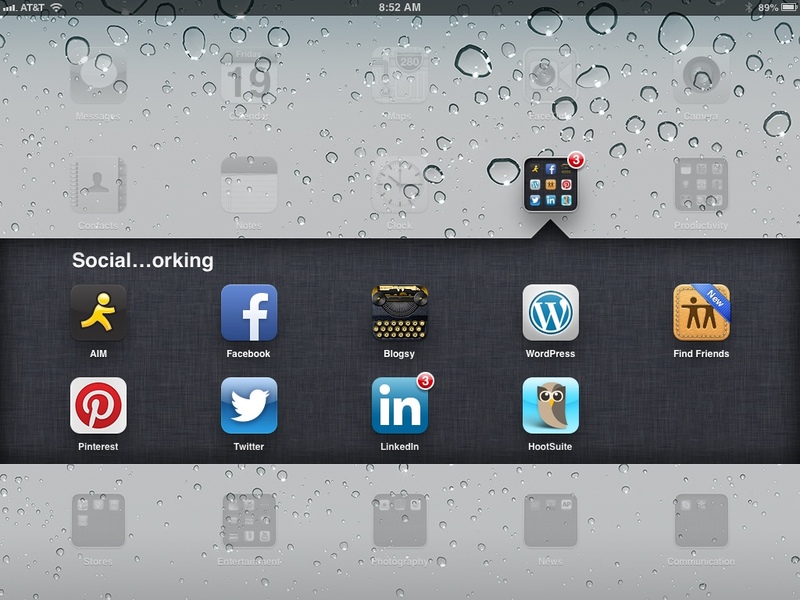 I’ve got nine apps designated as social networking: AIM, Facebook, Blogsy, WordPress, Find Friends, Pinterest, Twitter, LinkedIn and Hootsuite. With the exception of Find Friends, each of these bad boys gets run. And since I’ve already written about WordPress on at least one occasion, that brings us down to seven. I guess I’ll do this scientifically. So Yoda put me up on Blogsy a minute ago. 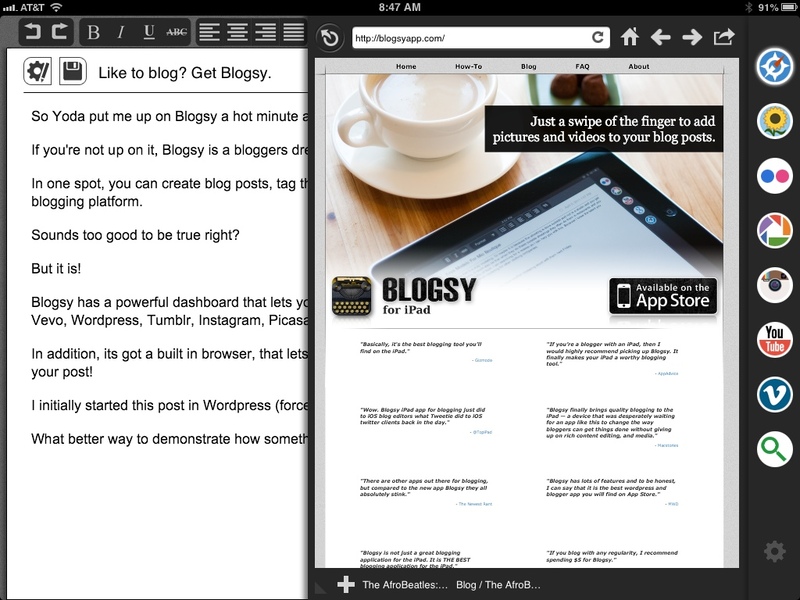 If you’re not up on it, Blogsy is a blogger’s dream app. In one spot, you can create blog posts, tag them, drag & drop photos and video, and post to virtually any blogging platform. Blogsy has a powerful dashboard that lets you access any of your supported accounts, including YouTube, Vevo, WordPress, Tumblr, Instagram, Picasa, Flickr, and Facebook, all from within the app. You can configure all of your accounts in Settings, and access them in the handy drawer conveniently tucked away on the right side of Blogsy’s main window. In addition, its got a built in browser, that lets you find and grab content from the Internet and drop it right into your post! I initially started this post in WordPress (force of habit) before switching over to Blogsy to complete it. What better way to demonstrate how something works? 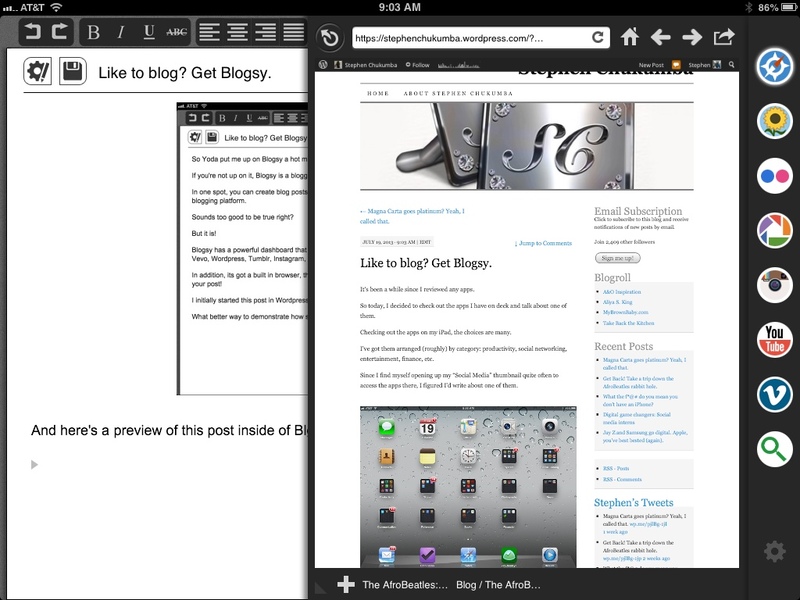 So here is a shot of me launching Blogsy in the built in browser. And here’s a preview of this post inside of Blgsy. And here’s a video from YouTube. In addition to being able to grab stuff from virtually anywhere, you can also publish directly from Blogsy to any of your blogs. Case in point: I published this right from my iPad. Or save your drafts locally or in your platform of choice. It’s really a complete, well thought out and super convenient app, and I highly recommend it if you’re a power blogger like me (not really). Not that there aren’t some glitches. For example the drop and drag function is a bit wonky. Placing an image or video exactly where you want it to go can be…challenging. Your text goes all haywire and its hard to know where your image or video is going to end up. If you’ve got multiple blogs, like I do, figuring out which one you’re in and making sure you’re posting to the right one is a chore. And getting around the app take a bit of getting used to at first. But I found that messing around a bit will help you to not freak out and figure out how things work. Anyway, I dig Blogsy a lot. And I think you will too. So get out there and blog(sy)! Note: I am not being paid by Blogsy to endorse their product. But if anyone from Blogsy wants to cut a brotha a check, I’d be much obliged. Thank you so much for writing about Blogsy. I am happy to hear you are liking it. 1) When you drag in an image/video are you using a finger on your other hand to scroll your post up and down so you can place the image/video exactly where you want it to be? 2) Setting the blog is right at the to of the Post Info. menu. I am not sure what trouble you are having figuring out which blog you will be publishing to. And when you publish it says what blog you will be publishing to in the confirmation message. If you could explain this to me I would like to help – info(at)fomola(dot)com. Again, thank you very much for writing about Blogsy. Lance, thanks for your comments and feedback. I am notorious for ignoring “how-tos” to my detriment. I’ll check out your tips and let you know how I fare. I just love it when brands pay attention to their users! Kudos to you! Thanks for answering my comment. I think most people ignore how-tos (me too). And we hope that people can use Blogsy without watching them. But there are a lot of things Blogsy can do and a lot of tips we like to give to make things easier and the only way we know how to help users like this is through the how-to videos or how-to guide. I had to smile when you wrote, “I just love it when brands pay attention to their users!”. “Brands” sounds like some big company to me. We are just a couple of guys trying to put out apps we are passionate about and are proud to put our names behind. BTW – do you know we recently released a new app? 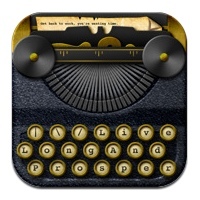 It’s another app that we hope makes a blogger’s life easier. It’s an iPhone app for uploading photos to a blog’s media library (PUPS – Photo UPloader for blogS). If you would like to learn more the website with the information can be found here – http://www.fomola.com/pups/.